Wayne Rooney and Leighton Baines will be among the new boss’ key priorities. 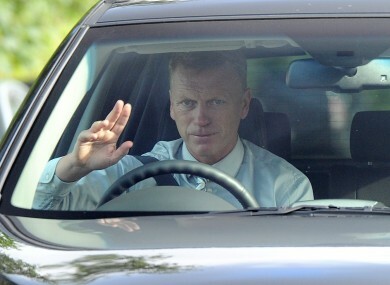 Moyes arrives on his first day of training yesterday. ALEX FERGUSON MADE no secret of Wayne Rooney’s desire to leave at the end of last season. And the situation does not appear to have drastically changed since then, though Moyes is understood to have met with the striker today. Presumably, he’ll attempt to persuade Rooney to stay, as the England international at his best is an asset to any club. While his past differences with the striker are well documented, with Moyes at one stage suing the player whom he previously managed at Everton, he will undoubtedly recognise that Rooney has been a vital player in the past for United. Yet should the striker insist on leaving, it is imperative that the Scot finds a suitable replacement before the summer transfer window closes – with the similarly creative-minded Thiago Alcântara one of the players who could conceivably help fill the void should the Englishman depart. While Michael Carrick was an unexpected revelation last year, the suspicion remains that United could do with strengthening in the midfield department. Paul Scholes is unlikely to come out of retirement a second time, and his absence will certainly be keenly felt. Of course, given that they won the Premier League last year, it could be argued that what isn’t broken should not be fixed. Nevertheless, with their rivals, and in particular Chelsea, strengthening this year, they are likely to face a sterner test compared with last season. Moreover, they were largely disappointing in the Champions League last term, and will surely need to improve considerably if they are to have any aspirations towards winning the trophy. Nani, Ashley Young and Antonio Valencia all showed indifferent form in the last campaign, despite the club’s title success. Moyes must either help them regain the type of confidence that each player tends to show at their best, or identify superior replacements promptly. Yet of the players that the club have been persistently linked with in recent weeks, relatively few are wingers. Though Gareth Bale and Cristiano Ronaldo can of course play out wide, both prefer to operate more centrally these days. All of which suggests a new winger is not one of Moyes’ main priorities for now, and that he has a certain degree of faith in the players who are currently available to him. The United boss is clearly intent on signing his former player. The club have already had one bid rejected for the England international, and it’s being widely reported that an improved offer will be submitted. At this stage, Patrice Evra undoubtedly knows that Moyes does not have complete faith in him, given the strong competition he would face from the Everton player. Therefore, it’s even more important that the club finalise a deal with Baines or a full-back of similar quality, with Evra’s morale potentially suffering as a result of these developments. If Moyes was in any doubt that he was set for a baptism of fire, the club’s fixture list will have provided a stark reminder of the challenge he faces. The club’s opening five games includes meetings with Chelsea, Liverpool and Manchester City. Consequently, it’s essential he assuages any doubts in the players’ minds swiftly, and convinces his men that he is capable of maintaining the standard set by Alex Ferguson. Three early losses in these matches against their bitter rivals could conceivably prompt fans to grow disillusioned all too hastily, though Moyes will hope he receives the same level of patience that was afforded to Alex Ferguson in his early days at the club should early plans of his go awry. Email “5 immediate issues David Moyes needs to deal with as Man United manager”. Feedback on “5 immediate issues David Moyes needs to deal with as Man United manager”.